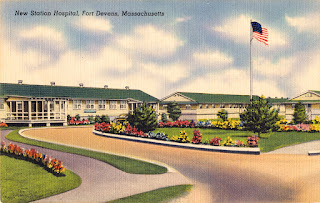 September 1918, Fort Devens, west of Littleton, was a major staging area for U.S. Army troops preparing to ship off to Europe, we having entered into World War I in April of that year. 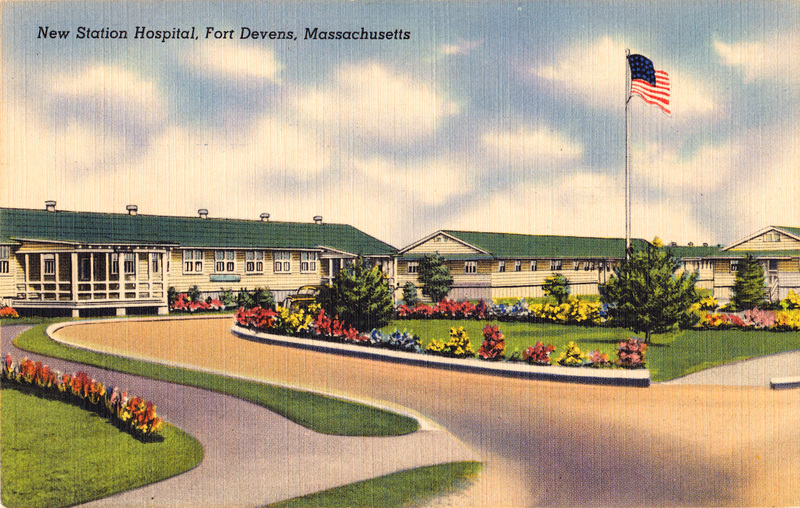 Fort Devens was also one of the two earliest stateside sites of the “Spanish Flu” pandemic, the other being among Navy personnel stationed in Boston. At Devens, the first case was reported September 8. By September 23 the number of men ill exceeded 10,500. Deaths reached 100/day. More than half a million Americans died. Worldwide, within little over two years, the flu infected an estimated half billion people, killing between fifty and one hundred million. Deaths were unevenly distributed by age and by region of the world. Influenza typically kills the young and the old. What was unique about this flu was that there was a high risk of death for people ages 15-35 years, the reason being that their immune systems responded too vigorously. In developed countries – those with hospitals and nursing care – deaths were on the order of two percent of the population. With poorer medical care, more like five to ten percent, and in remote reaches of the earth where people had fewer prior exposures to any strains of influenza, exceeding twenty percent. in the fall of 1918 deaths exceeded 100/day. Viruses have been described as being a bit of bad news (in the form of a strand of DNA or RNA) wrapped in proteins. For this influenza virus damage was threefold: 1) the virus getting into cells, replicating and then killed those cells so as to re-enter the blood stream to find new cells, 2) the patient’s immune system reaction to the foreign proteins coating the outside of the virus, causing more damage than the actual virus, and 3) viral infection created an opportunity for bacterial pneumonia. This particular virus caused so much damage because it reached deep into the lungs rather than just the upper respiratory system, and because it triggered a massive inflammation response. In effect, people were dying of collateral damage as their immune system over-reacted while trying to neutralize the virus. At autopsy, lungs were often blueish, signifying oxygen deprivation, and filled with fluid. Those the virus-triggered reaction did not kill outright succumbed to bacterial pneumonia. Patrick D. Meagher, Curate at St. Bridget's Church. 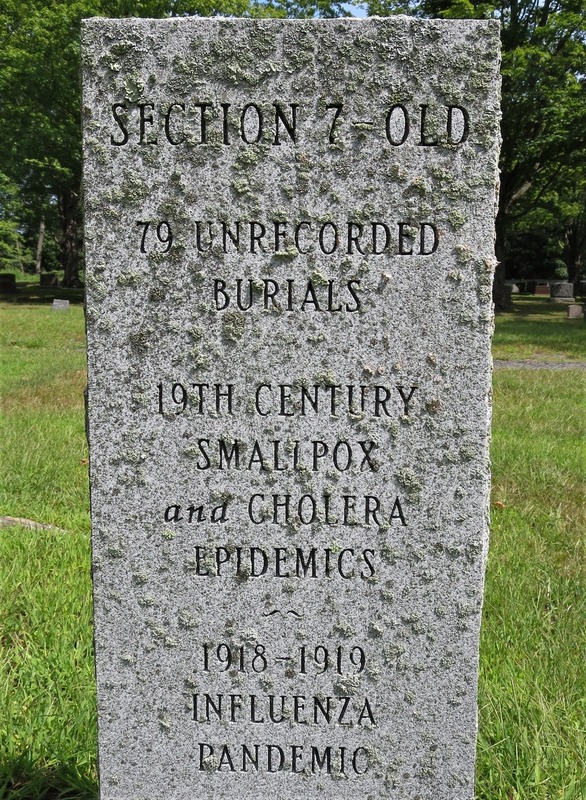 Locally, the arrival of influenza is documented in the Town of Maynard Annual Report, which reported deaths with causes noted. 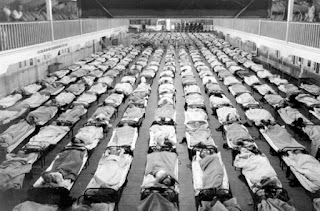 Regardless of whether the contagion reached Maynard from Fort Devens or Boston, the first death identified as either influenza or “la grippe” dates to September 22, 1918, the last on July 21, 1919. 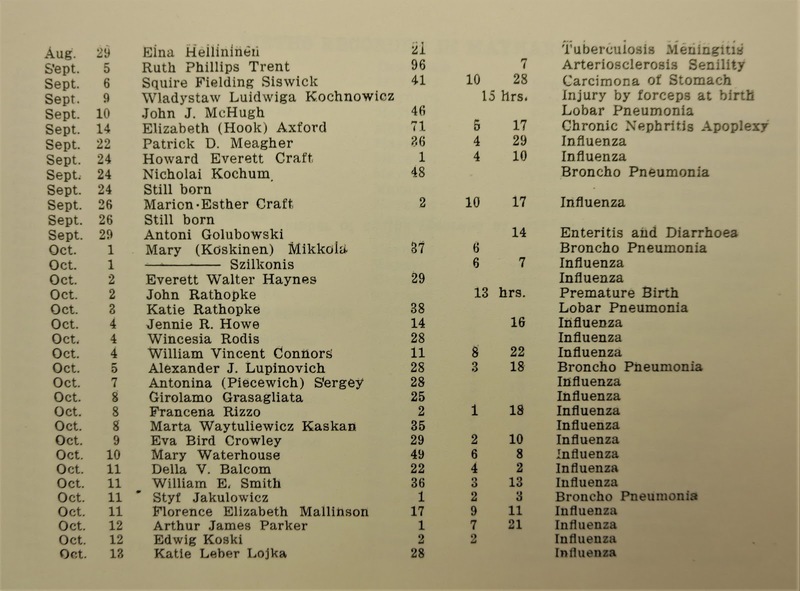 In that interval there were 38 deaths identified as influenza and another 18 attributed to pneumonia. Combined, a bit under one percent of the population. Likely, ten to twenty times that number had become ill but recovered. Schools were closed for five weeks. 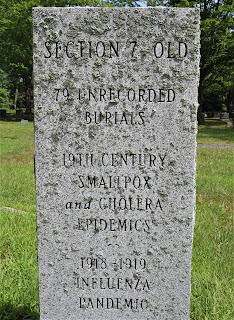 Glenwood Cemetery has a section (7-O, old cemetery) with unmarked graves of Maynard citizens who died from cholera, smallpox and influenza epidemics. A single stone was erected in their memory by the Maynard Boy Scouts. 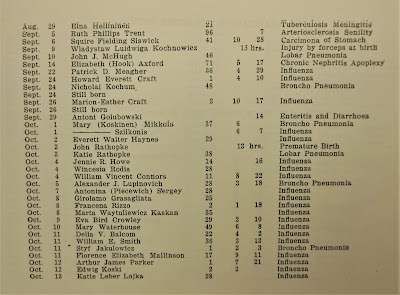 The Town of Stow Annual Report listed 11 deaths from broncho or lobar pneumonia, the first occurring September 21, 1918. Population was 1,100 compared to Maynard's 7,000 so this would have also been around one percent. monument for section with unmarked graves. True ‘Ground Zero’ for this pandemic is disputed to this day. Influenza viruses are pan-species, moving back and forth among people, pigs and birds. Researchers propose Kansas, or a troops staging and hospital camp in France, or perhaps China (?!). To this last, military historians point out that with so many men of France and Great Britain in uniform, nearly 100,000 Chinese laborers were transported to France for purposes of behind-the-front labor. There is some evidence that a respiratory illness recorded in China was a precursor to what mutated into this extremely lethal virus. 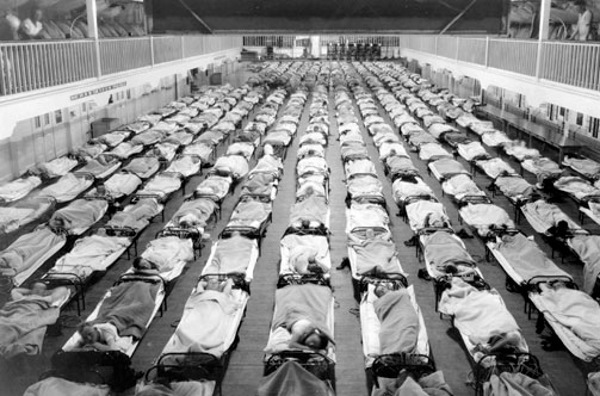 Since the influenza pandemic of 100 years ago there have been other, smaller pandemics – the Asian flu of 1958-59 and the Hong Kong flu of 1968-69 each killing on the order of one million people. Each spring, in the United States, the Centers for Disease Control and Prevention (CDC) identifies the three or four strains of flu likely to be prevalent in the pending fall and winter, and prepares an injectable vaccine. New vaccines are needed each year because the rapid mutation rate of influenza RNA means that the immune system virus identification ability engendered by the previous year’s vaccination will not continue to be effective. Flu vaccines protect against the three or four viruses (depending on vaccine) that research suggests will be most common. The CDC has already determined which strains will be used for the 2018-19 flu season: A/Michigan/45/2015 (H1N1), A/Singapore/ A(H3N2), B/Colorado/06/2017 and optionally, B/Phuket/3073/2013.